You are currently browsing the tag archive for the ‘culture’ tag. Craic (pronounced crack) is an Irish word that basically translates to “fun,” “chatter,” and general enjoyment. A common greeting here is “What’s the craic?” and people often say that they are going out for a bit of craic. Galway is full of places to experience some good craic, and we have become fans of one place in particular: Monroe’s Tavern. Every Tuesday at Monroe’s, a diverse group of people assemble, greet each other, and put on their dancing shoes. A band, consisting of different instrument combinations every week, warms up. Once enough people are present, the music starts and the dancing begins. 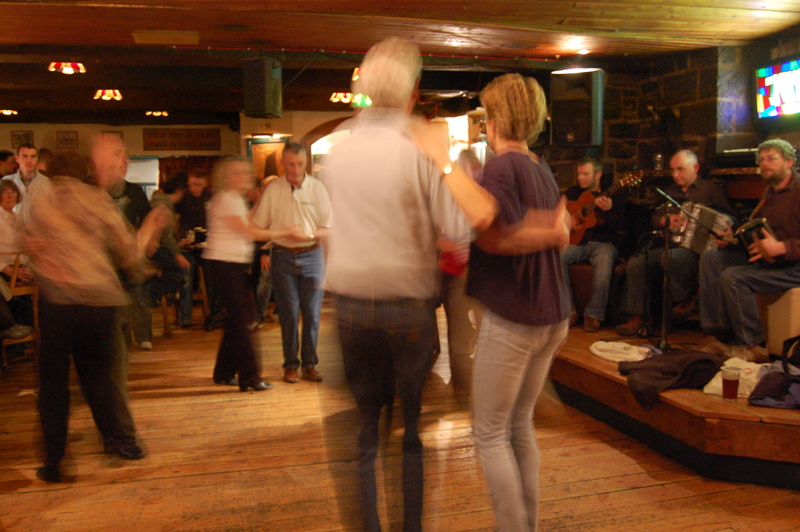 The type of dancing is called set dancing, a traditional Irish folk dance, which reminds me somewhat of American square dancing. Pairs dance together, spinning, switching dance partners, and stomping feet. The songs are short, but the band plays one right after another, with little to no break. The dancers continue, and over the next two hours, the group grows larger and larger. After a couple of weeks watching the dancing, we began to recognize faces and pick out some of the regulars. One older gentleman, who must be in his 70s, is the first to arrive and the last to leave every week. He comes prepared with a towel to wipe the sweat from his brow. It appears that he never needs a break – he is constantly in motion. You can tell that he lives for Tuesday night dancing. Another graying gentleman, tall and graceful, has impressed us with his skill. He knows all the correct footwork and his special dancing shoes click and clack along with his enthusiastic steps. We were lucky to strike up a conversation with one of the regulars a couple of weeks back. Terri, a Galway local and avid dancer, was sitting for a break and a drink of water at the table next to us, when we started to chat. She told us about the step dancing festivals that happen all over the island, about the community of dancers in Galway, and explained to us the different dances as they were happening. Terri now greets us whenever we come through the doors of Monroe’s on Tuesday, and when she takes a break, she comes to chat. Last week, we inquired about some of the regulars on the dance floor, and learned that one was from France, and another from Germany. But on the dance floor, you’d never know it – everybody looks like they’ve been doing Irish step dancing their entire life. One day maybe we will get up the nerve to join the group and learn a couple moves. Terri would be thrilled. If the French and German members can learn, why not a couple of Americans? First of all, this post isn’t meant to give anyone any ideas; it’s not about anything remotely close to me being pregnant in Uganda! Being in a foreign culture for some time, you learn things in small steps. First you notice some obvious cultural differences, then maybe you find out about some more nuanced parts of the culture. And after you think you’ve got it all figured out, pieces of the culture reveal themselves to you, pieces that you didn’t even realize were there. Attitudes around pregnancy fit into the latter category for me. Pregnancy in Uganda is a really interesting thing, with so many social rules that it’s hard to remember how to behave appropriately! I was initiated into the world of Ugandan pregnancy upon my return to Uganda from a month-long trip to the US in November. During that month, I’d found out that my good Irish friend, Muireann, who worked at Uganda Crafts with me in the summer of 2006, is pregnant with her first child. I excitedly came back to Uganda Crafts with the news, hoping to have lots of fun conversations about the future of the little one with Betty, the founder of Uganda Crafts, and Ninah, her daughter who works there. This is where all the cultural fun begins… Due to Ninah’s pregnancy, I had the chance to learn all about what typical Ugandans think about pregnancy and children and how different it is from us in the US! 1) Having children in Ugandan culture is of the utmost importance. Married or unmarried, religious or not, if you’re getting towards your 30’s and don’t have a kid… it’s time. 2) If you are married… then you’re expected to have kids right away. Jon and I are a real disappointment around here! 3) Once you are pregnant, you’re not supposed to tell anyone except the father. This is, apparently, to lessen the chance of someone “bewitching” you and hurting the unborn child. 5) Therefore, Ugandans find it somewhat rude when mzungus either announce their own pregnancy, comment on someone else’s pregnancy, or ask questions about it (Do you know the gender? When is the baby due? Etc.) I have seen people do each of the above to Ninah a few times, and had to watch her squirm and avoid answering all questions. 6) Once the baby is born, doesn’t matter where the father is, he gets the final say. For instance, Ninah’s baby’s legal name was chosen by the father, even though Ninah calls her Amira. And even though Ninah is raising Amira and is Muslim, the baby will grow up Christian, because that’s what the dad is. With all the Uganda Crafts babies around, there has been an increased clamor for a little Marino. Although I do look forward to the day when Muireann, Ninah, and my kids can play together, I’m certainly not quite there yet. But you can bet I’ll break all the Ugandan rules and make a big announcement to my Uganda Crafts family when it is time!